Although a small country, the Netherlands is quite interesting and unique, plus it is absolutely beautiful. Amsterdam is its largest city and nominal capital, but Hague is, in fact, a place where most of the crucial Government institutions are seated. Moreover, this amazing city is the residence of the Dutch King, as well as the place where International Court of Justice holds its tribunals. Hague is quite a big city and it attracts tourists from all around the world mostly because of its amazing history and even better seaside resorts. Hague is the Netherlands’ third-largest city, located on the shores of the North Sea. It is mostly known for its amazing sea resorts Scheveningen and Kijkduin. Also, Hague is the political as well as a commercial, cultural and touristic centre of the entire country. But in spite of all of that, Hague is not as vibrant as Amsterdam. People living here enjoy in a less hasty and quieter way of living. Reaching Hague is easy through The Hague Rotterdam Airport – the distance between these two cities is less than 30 km, so they share the same airport. Getting around the Hague is easy thanks to its modern and efficient public transport. Most of the people use light rail or trams, but buses are also very convenient. The Hague was established in the early 13th century, and for most of its history, it was just a small town. The situation remained the same even after it became a home to the Dutch Government in late 16th century. But from the middle of 19th century, the Hague began to develop at a much higher rate. The cause for such a situation was a fact that Government institutions started to become more and more powerful. The city was heavily damaged during the World War II due to a heavy bombardment of the Nazi V2 rocket installations. But after the war ended, Hague became one of the largest building sites in the entire Europe. The whole city was rebuilt and modernized in just a few years. Today, Hague is the third largest city in the Netherlands and it is a home to vast green parks and other commodities, which attract millions from all corners of the world. Although Hague is not as vibrant as Amsterdam, it is still an awesome place to go to, especially since there are numerous attractions. Visiting its historic centre is an obligation. You will be able to see buildings from Medieval, Renaissance, and Baroque period almost in the same place. Plein is Hague’s main square where most of the government buildings are situated as well as some of the best restaurants and bars in the entire city. Right next to it lies the Binnenhof – the medieval castle turned into a seat of the Dutch Parliament. It is completely surrounded by amazing buildings from various periods of history. You can see mansions dating back to the period between 13th and 19th century. There are many great Museums in Hague, but Museum de Gevangenpoort, with its collection of medieval torture instruments, is among most interesting and most popular. Bredius Museum is another cool spot, especially for the art lovers. Mauritshuis is also a magnificent Museum with interesting artefacts such as personal items of the King William V or the drawings of various artists, including Johannes Vermeer, Rembrandt van Rijn, and Andy Warhol. There are many other extraordinary places to visit in this awesome city but you will have to check them out yourself. The list is simply too long for this text despite all of them being super awesome. Being the third-largest city in the Netherlands, the Hague offers a vast number of possibilities when it comes to accommodation capacities. Of course, it considers not only luxury and all-inclusive lodging options, but in addition, you can find literally anything you need in accordance with your budget. As anywhere else in the world, hotels and hostels are the most popular types of accommodation. However, having in mind that the Dutch people have somewhat freer views of life, visitors to the Dutch cities may also experience other kinds of lodging that are quite affordable. In the last couple of decades, tourists cut on the expenses wherever they can, and accommodation is the first one where they tend to save money. The same money is, again, later directed to sightseeing tickets, museum tickets, various excursions and so on. For that reason, bed and breakfast lodging accommodation became extremely popular among the tourists. This kind of accommodation is not only cheap and affordable, but it also satisfies basic needs of the visitors – clean sheets, nice room and the most important meal of the day, breakfast. The Hague is not an exception when it comes to B&B accommodation type, and every new year, more and more breakfast and bed possibilities are offered to the tourists. Hence, if you are one of those who is happy with the service of B&B, you are lucky because the Hague will offer you the chance to book this kind of lodging even in the central part of the city. Our recommendation is Emma’s B&B. But there are also many other options. All you need to do in advance is to search the offers online and make sure there are free rooms for you and your fellow travellers. Another great option, which provides you with a complete freedom and privacy is to rent a private apartment. The possibilities are endless and no matter what time of the year you decide to visit the Hague, you will surely find a suitable apartment, that not only has all you need but also does not cost a fortune. One of the suggestions is the Scheveningen Delight, located around 2 km from Maurodaum. It is easy to reach all the major parts of the city, and the apartment is well-equipped with kitchen appliances as well as other supplies. Another excellent option is Calliope Apartment, being only 500 meters away from New Babylon. It will undoubtedly make your stay in the Hague an unforgettable one since it has everything you may need. The Calliope Apartment will simply make you feel the homelike atmosphere, and the best part is that you may quickly arrive at any part of the city. In case you are a person who is used to staying in hostels, we have great news. Hostels in the Hague are amazing, and for a very good price, one can get more than decent service. Visitors to the Hague can not only find central-part locations, but they can enjoy the interiors of the hostels as if they were in a range of middle-class hotels. A good option of a hostel is most certainly Stayokay Den Haag. It provides you with the possibilities to stay in the dormitories or to take private rooms. It is usually aimed at young people, but the careful, nice, and polite staff of the Stayokay Den Haag Hostel tend to attract business people as well as families. For that reason, there are special offers aimed exactly at these categories. All you need is to contact them and wait for the best offer. In case Stayokay Den Haag is entirely booked, you may try at Jorplace Beach Hostel or Kingkool. Hotels are, on the other hand, always popular, and tourists never lose their interest in booking one of the hotels with amazing offers. The Hague’s hotels are readily awaiting the tourists, with plenty of them being built every year. 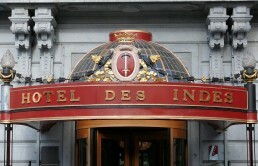 However, the most popular ones are Hotel Des Indes The Hague, Hampshire Hotel – Babylon Den Haag, Badhotel Scheveningen, Hotel Sebel, Carlton Beach and De Pier Suites Hotel. Some of them are luxury oriented hotels, providing their visitors with the royal-like treatment, and the others are three and two-star hotels with great service and affordable prices. All you need to decide on are the locations. Choose the one that best suits your needs, and your stay in the Hague will be the best experience in your life. The Dutch cuisine is not so popular and familiar in the world, yet tourists are still advised to taste traditional meals while in the Netherlands. The thing is, to really get to know the tradition, culture, and customs of a country you are visiting, you also need to know its cuisine. The truth everyone knows about the Dutch cuisine is that it is quite simple. It uses a lot of vegetables, and very often fish or some other meat is added to the meals. 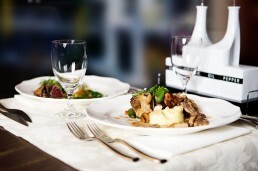 Should you want to have a good traditional lunch in the Hague, try to find restaurants that offer uitsmijter. This is a phenomenal dish, made of 3 sunny sides up eggs, served on top of the ham. Cheese and bread are also placed under the eggs and ham. If you enjoy vegetables, you will get a small portion of salad next to the dish. The salad usually involves tomato pieces, a bit of cabbage, and onions. Dutch pannenkoeken is another interesting suggestion for the gourmets in the Hague. These come in a size of a plate, and the cooks usually describe them as the pancakes that stand between French crepe and American pancakes. However, these differ in the toppings, and they are usually served with the pieces of pineapple and sugar syrup called stroop. Apple cake is a traditional meal that falls in the dessert department. You can find apple cake in every cafe as well as a restaurant, and for all of you who are curious, the Dutch apple cake considers deep dish apple pie topped with whipped cream. It is excellent and we are sure you will simply adore it once you taste the amazing Dutch dessert. The Hague is full of interesting things to see and do, and if you are one of the tourists who besides visiting art galleries and museums also likes to investigate the city alone, then you are in the right city. You can always buy tickets for various excursions and picnics, but our suggestion is not to miss Scheveningen en Kijkduin, a beach in the backyard of the city of the Hague. Here, you can enjoy various sports activities, paddling, kiting and surfing. But long beach walks are also a must. What is more, the Hague is perfect for shopping tours since it has numerous centres with super high outlets and world-famous stores. One of the centres is Hofkwartier. It offers unique products and things you never dreamed to buy in the Hague. Another great post from you kevin, I have been to Amsterdam but never even heard of Hague. Next time I’m in the netherlands I shall give it a look in. I visited a few years back and I remember it so well. It’s a great place to visit and now I’m thinking of returning. Thanks for sharing kevin. Thank you, Amy, if you have any other questions feel free to let me know. Is Hague full of cannels? The first shot looks so beautifull and full.of colour. I’d love to visit. The Hague has its fair share of cannel Karen, they do make for great morning walks. You should visit, it is so beautiful! Amsterdam is just the start of the Netherlands, yes, the Netherlands has so much to offer and I guess people do only think of Amsterdam. I’m glad you enjoyed this post. Sign up to never miss a beat! Never miss a blog post – just enter your email address below and you’ll get an email every time I publish a new post! Join other readers and get all the action from Kevin's Travel Diary's Newsletter!